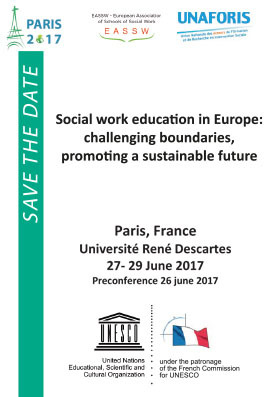 The General Assembly of the EASSW was held on June 30th 2015. during the conference „Social Work Education in Europe – towards 2025“ in Milan, Italy. At the General Assembly, new president, vice-president, treasurer, secretary and five new members of the Executive Committee were elected. New members of the Executive Committee are: Marika Smirnova from the Riga Stradins University, Latvia, Hakan Acar from the Kocaeli University, Turkey, Teresa Bertotti from the Milano Bicocca University, Italy, Marion Laging from the Hochschule Esslingen, Germany, and Raymond Kloppenburg from the Hogeschool Utrecht, The Netherlands. For his second mandate was reelected Ronny Heikki Tikkanen from the University of Gothenburg, Sweden. All members of the Executive Committe and officers were elected on mandate of four years. Other members of the Executive Committe elected two years ago: Aila-Leena Matthies, from the University of Jyväskylä, Finland, Violeta Gevorgianiene from the Vilnius University, Lithuania, Anke Beuck from the VIA University College, Denmark, Clara Cruz Santos from the University of Coimbra, Portugal and Andres Arias Astray from the Complutense University, Spain will continue their mandate in next two years.